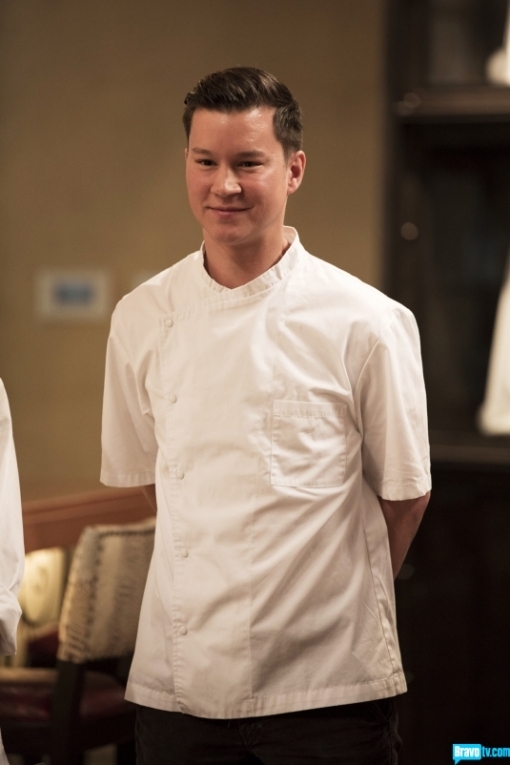 Top Chef has returned, and it is a veritable Asian American parade, you guys. The chefs started out in four groups, each group working on one task with a judge who would determine which chefs would make it to the show in Seattle. In Emeril's group, which was tasked with making soup, we met Kristen Kish, chef de cuisine at Stir in Boston. Kristen started out as a model at age 13, but her true passion is (duh) cooking, an interest she shares with fellow competitor Stephanie, her good friend with whom she got matching spoon tattoos. Too bad, then, that Kristen's English pea broth with lemon peel, apple, and seared scallops got her through to the competition while Stephanie was sent to pack her knives. I'm sure it didn't help Stephanie to hear Emeril call her BFF's dish "one of the best soups I've had in a long time." Sorry, pals! Also in the soup group was Jeffrey Jew, a personal chef from Washington, DC. Jeffrey decided to go with a chilled gazpacho, a choice that had Emeril feeling doubtful about timing: "If he gives me a hot gazpacho, he's out." Jeffrey put his watermelon and tomato soup with peppers and ceviche in a shallow pan and then popped the pan into the freezer; Emeril deemed it "lovely" with "a lot of great depth" and, above all, cold. Jeffrey also got a Top Chef coat. Smiling because he knows he can chill a soup. Wolfgang Puck had his group make omelets, and Kuniko Yagi came up with a pretty unique take on the challenge. Originally a banker in Tokyo, Kuniko hated her job and came to the US to pursue her dream of becoming a chef -- a decision her family did not support. 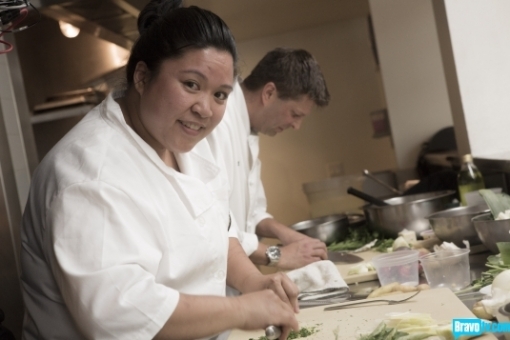 Completely self-trained, she is now an executive chef in Los Angeles and wants " to drink the coffee in Seattle." She made a chamomile milk, morel mushroom, and ham omelet with kale chips, and Wolfgang said the dish had "very interesting flavor." 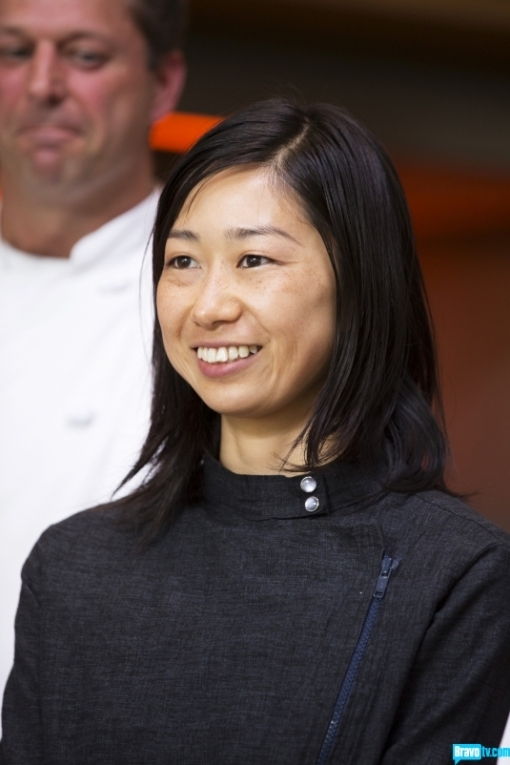 Kuniko will indeed get to taste the coffee in Seattle with the rest of the Top Chef crew. I should also note a moment during prep when a chef commented on Kuniko's kale chips saying something along the lines of "I know I shouldn't have set up next to origami." I couldn't quite catch it, so I may be mistaken -- anyone else hear exactly what was said? If I heard correctly, I guess it was meant to be a compliment; it just doesn't exactly make sense. Weird. Kuniko's relieved to not be in finance. Chrissy Cambra, chef at Bar Pastoral in Chicago, also took on the omelet challenge. Chrissy decided to make her take on a Filipino torta, coming up with a lobster, bacon, caramelized onion, and fennel (YUM) omelet that Wolfgang said "could have used a little salt," but he liked that she brought her heritage to her dish, "and it looks pretty good too." Chrissy also made it to Seattle. And finally, (yes, there's more! ), Sheldon Simeon had to make a salad for judge Hugh. Sheldon is the executive chef at Star Noodle in Lahaina, Hawaii, and he was a semi-finalist for the James Beard Rising Star Chef award and was a People's Choice for best of the Pacific and Pacific Northwest in Food & Wine Magazine. Despite all the accolades, Sheldon says, "I'm just a kid coming from Hawaii." In fact, besides a short stink working at Disney World, Sheldon has never lived outside Hawaii. 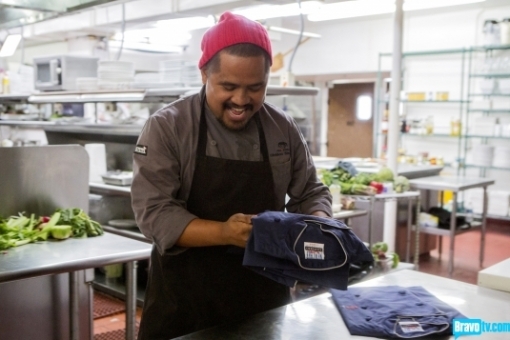 He started out as a dishwasher and worked his way up to executive chef. Pretty focused dude. For the challenge, he made a fried brussels sprouts salad with an orange Thai vinaigrette, combining some of the Asian influences he's been exposed to in his home state. Although Hugh noted that brussels sprout season ended three months prior and he could have used a little more vinaigrette, he sent Sheldon through to Seattle. Five for five, guys! It's gonna be a great season. On RuPaul's All Stars Drag Race, the queens had to get people on the street to do various humiliating things (eat out of a drag queen's hand, smash an egg on your forehead) to earn points. I was sure that team Rujubee clinched it when Jujubee got a guy to let her squirt whipped cream down his pants (seriously! ), but they didn't come out on top. In fact, on the runway Michelle told Juju that she would have liked to see something else on top of her corset to make it pop. Jujubee, too plain? Perish the thought. Manila, on the other hand, received high praise for her look: a severe, dark, Morticia-esque version of the usual Luzon style featuring an upside-down black pump with a feather as a headpiece. Santino called it "one of the favorite outfits I've ever seen you in," and guest judge Rachel Dratch called Manilla "so tippy-top." And yet! It was teams Rujubee and Latrilla in the bottom two, and our own Jujubee and Manila were in a lip sych match-up to Janet Jackson's "Nasty." Juju stayed true-true to her own classy self, and Manila took off her headpiece and went for a truly nasty take on "Nasty." Both queens were fierce, but Jujubee and Raven were safe in the end. I'm sad to see Manila go; we've had our differences in the past, but I was curious to see how her act has changed and whether she's learned any new tricks since last we saw her. Girl, I know we'll be seeing you around. Like right here in a video she made with her teammate, the lovely Latrice Royale. On Project Runway All Stars, the designers had to make their own fabric patterns using spray paint and graffiti techniques. Ivy was inspired by the idea of girl power and creating a superhero suit, which I was totally on board for, but she decided to accomplish this by writing words of empowerment like "passion" and "courage" over comic book-like bursts of yellow and red. Can I be brutally honest here? I thought the fabric design looked awful. Even though Ivy created a crisp jacket (one of her fellow designers said it looked a lot like a repeat of the first challenge jacket) and an interesting skirt (it plays with translucency like last week's design), I really thought that the big, ugly lettering would send Ivy straight to the bottom. Well, the judges and I couldn't have differed more because they put her in the top three. They called the look "very modern, yet she has a sensual edge," and "a great play on a suit." They were divided on the translucent part of the skirt, and Isaac merely mentioned that the big "tenacity" splashed across the front of the outfit was "on the nose." In deliberation, the judges agreed that a tailored jacket is the most difficult thing to do, though its similarity to her previous jacket did come up. In the end, Ivy didn't take the top slot, but I guess she's won told-you-so rights with me, at least until next week. 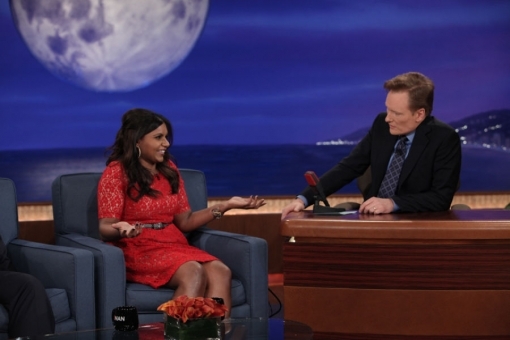 My friend (okay not really, only in my mind) Mindy Kaling was on Conan this week. If you haven't already seen Wreck-It Ralph (Mindy plays one of the mean girls in the movie), run don't walk. She discussed the awkwardness of kissing actors on screen as well as her Conan internship that started her career in show business. How far you've come, Minds! "I used to work for you, Conan. So weird." Dianne Choie's TV is in Brooklyn, NY. She has a cat, several reusable shopping bags, and other mildly annoying stereotypes of youngish people who live in Brooklyn. Read more about Hyphen TV: Hot Gazpacho? Hyphen TV: Is She High? Mindy had a chick fight on her Thanksgiving show. It appears Mindy enjoys slap stick/physical humor. . I am wondering who inspired her sense of humor. The 3 Stooges?